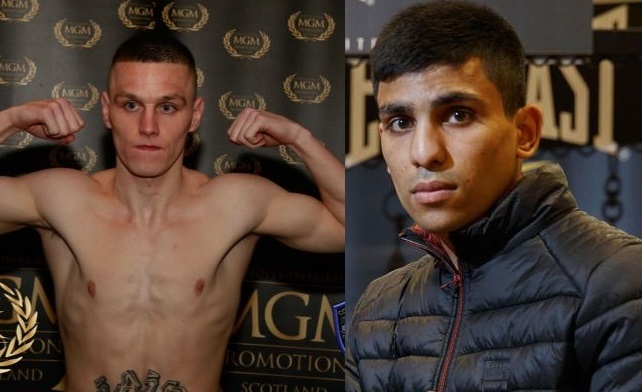 Iain “Baby Butch” Butcher beat Scott McCormack comfortably on points over 8 rounds at the weekend in his 1st fight at Bantamweight, could this set up a potentially explosive encounter with recently crowned Scottish Champion Kash “Untouchable” Farooq? Kash won the title last month in emphatic style defeating Scott Allan when the corner withdrew their man in the 8th round. With Iain having moved up to the same weight class there is now no shortage of Scottish opposition for Kash should he decide to go down that route. Stablemate Jamie Wilson is also in the mix at this level and no doubt Lee McGregor will be soon be knocking on the door as Barry McGuigan has (perhaps a little prematurely) already stated he feels he is ready to challenge for British honours. However a good look at the fights unbeaten Kash could have against his Scottish opponents and it is Iain who sticks out as the one who would more than likely give him the most trouble. Iain certainly has the pedigree having been on Team GB as an amateur and it would be reasonable to say that the former WBO European Flyweight champion has also been in with higher level opposition. Iain has fought Kevin Satchell for the British Flyweight and Charlie Edwards for the British Super Flyweight Belts although ultimately lost on points in both contests. He has also already mentioned that he would like to be matched up quickly next year with an eye on another shot at a British or indeed Commonwealth Title. Iain certainly appears to be much more comfortable having moved up to Bantam, he has previously had trouble making the weight in previous fights and was certainly weight drained against Charlie Edwards. However, there is no doubting he has the skills that could trouble Kash who was very impressive in dismantling Scott Allen in his last fight and is starting to punch with more authority these days. In terms of experience, Iain would also seem to have the edge having had more fights (record 17-3-0) than Kash (8-0) as well as previously mentioned the higher class opposition. There is also that old saying of you can only beat who you have in front of you and Kash has dealt well with everyone he has faced so far. He is definitely a classy boxer with excellent footwork and head movement and seems to be progressing well under the tutelage of Craig Dickson. It may be that Kash decides to go down the British route himself as his last win was also an eliminator for the Lonsdale Belt prize. The promoters may well be the ones who decide when this one will happen and Iain’s promoter Sam Kynoch is known to like having at least one 50/50 fight on his shows which is what I think this fight is. Iain Wilson who looks after Kash has already stated he thinks that after Josh Taylor Kash is the most exciting prospect in Scottish boxing so hopefully they would not stand in either fighter’s way of this potential domestic dust-up as we have seen politics stop fights happening in the past. One thing is for sure it would seem that these 2 fighters are destined for a collision course at some point in the not so distant future and it will make for a cracker of a fight whenever it happens. Is Danny Jacobs vs. Billy Joe Saunders at Barclays a Possibility for 2018?